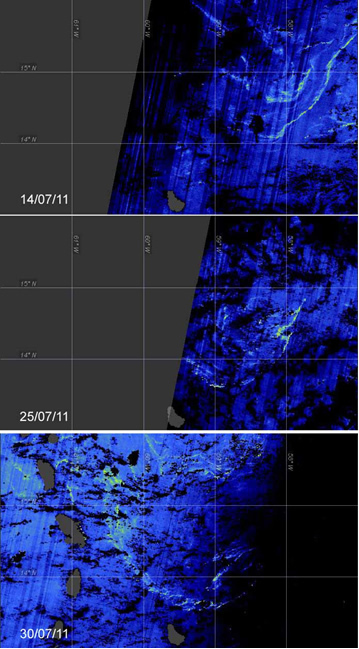 Aug 11, 2011 update from Erika Young and Jim Gower of Fisheries & Ocean Canada (Institute of Ocean Sciences (IOS): 'Floating vegetation slicks, probably of this same Sargassum in rafts at sea, were imaged by MERIS throughout July, 2011. Figure 1 [left] shows long sinuous slicks to the northeast of Barbados on July 14, 25 and 30, 2011. Comparison of the lower two frames of Figure 1, for July 25 and 30, suggests that a heavy mass of Sargassum should arrive on the north-east coast of Barbados by about August 10. The bottom frame also suggests that more Sargassum may be about to arrive on Dominica and Martinique' [and Saint Lucia]. Have a look at the bottom frame from 30 July 2011 in Google Earth - Sargassum slicks can be seen in the Caribbean Sea, particularly near Dominica. A major slick of Sargassum was then approaching in the Atlantic approximately 30km from Barbados and Martinique and about 70km from Saint Lucia. Saint Lucia had already reported heavy slicks on their beaches in mid July 2011, so the MERIS imagery analysed by IOS (i) might not be picking up "smaller" slicks due to its resolution and (ii) it seems that Saint Lucia and the rest of the Lesser Antilles can expect much heavier Sargassum slicks this month. The Observatoire du Milieu Marin Martiniquais (OMMM) in Martinique mentions that since May 2011 'huge amounts of pelagic sargassum have been piling up along the coast of Martinique and Guadeloupe in the Lesser Antilles'. Research by Fisheries & Oceans Canada in 2008 using ENVISAT MERIS imagery offers a tool for understanding the phenomenon. The full research article is, J. F. R. Gower & S. A. 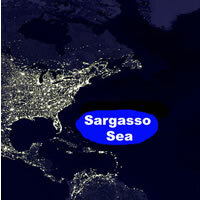 King (2011): Distribution of floating Sargassum in the Gulf of Mexico and the Atlantic Ocean mapped using MERIS, International Journal of Remote Sensing, 32:7, 1917-1929, and it may be downloaded as a preliminary Nature article. Thanks Bruce Potter, Shyma Pagad et Jean-Philippe Maréchal. Students' scholarships and bursaries will focus on ParCA; a project that will conduct comparative case study research in Tobago, Jamaica and two Atlantic Canadian provinces. The project will use a community-based vulnerability assessment (CBVA) framework in collaboration with coastal communities and local partners to identify vulnerabilities and exposures, and develop strategies for adaptation to climate change. Under this program, funding is available for Caribbean Nationals to study at the University of the West Indies or the University of Waterloo at Masters and PhD levels. Must have successfully completed an undergraduate or graduate degree at a high level in an area relevant to Climate Change including Climatology, Environmental Sciences, Coastal Management, Water Resources, Sustainable Tourism, Gender Studies. Must have been accepted and registered in a Masters or PhD Programme at UWI or UW. Evidence of professional experience in any of the fields indicated above will be an asset. 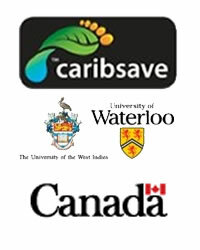 Applicants for Scholarships and Bursaries will be assessed by a Selection Committee established by the University of the West Indies, the University of Waterloo and The CARIBSAVE Partnership. Applications should be sent via email to The Office of Research, The University of the West Indies: pvcresearch@admin.uwi.tt and must be copied to The CARIBSAVE Partnership: hr@caribsave.org When applying please include `ParCA' as Subject in the email. The following should be included in your Application: an up to date Curriculum Vitae; a covering letter indicating qualifications; professional experience; preferred study location (UWI Campus or Waterloo); your area of interest for graduate studies and full contact details for three Referees. 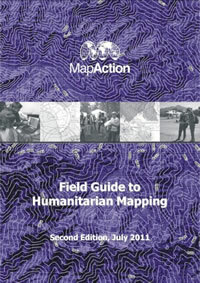 Closing date for this round of applications is 31 August 2011. *** Funding for this project and its student scholarships and bursaries is kindly provided by the Canadian IDRC and the Tri Council and disseminated through The CARIBSAVE Partnership, The University of Waterloo and The Unversity of the West Indies. Source: Secretariat of the National Emergency Management Organisation,Castries, Saint Lucia via C N Aguirre and Kate Lance.